NEXT | What's remained consistent throughout your entire WoW career? Whew. Well, yesterday sure was a day, huh? Let’s hope today’s more Tuesday than Monday. You’re in charge of designing a set of new icons for Guild Tabards. What sorts of things would you include? Flamingos. I would add flamingos. How are there no flamingos in the tabard options? If we’re going beyond the great pink bird of leg, I’d say we add some more Old God-like icons. Really, anything that represents a specific area of the game not already represented by a tabard would be cool. I think it would give roleplayers more options to represent themselves in unique ways. Heck, maybe give us existing tabard icons so we can be “inverse factions,” where we use the same icon but invert the colors. I realize this might take away from the prestige of getting faction tabards but… is that a big deal to people? Oh, and give us a color wheel for Yogg’s sake. 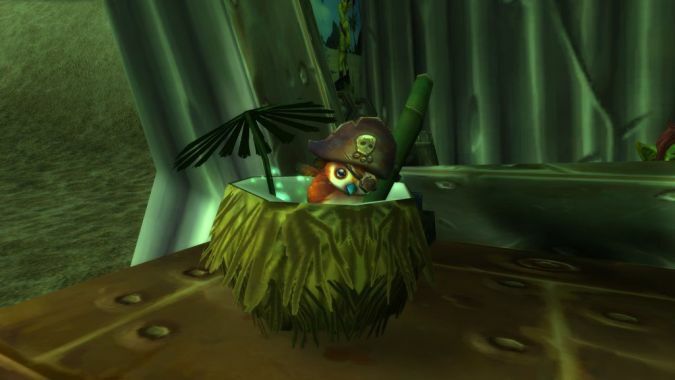 Q4tQ: do you think Blizz will put allied races in the nexpac, or take a break? I’m kind of hoping they, if not halt, at least severely slow down how many Allied Races they add per expansion. They’re cool, don’t get me wrong, but without a revamp of how you gain Heritage Armor and what level you start at, I have almost no interest in them. It’s just too much, and I don’t want to pay for a boost. Will they actually cut back? I don’t know. I’m think-hoping we’ll get one additional Allied Race in the middle of the expansion. From the upcoming Allied races thread: Can Kul Tirans actually be Shaman? If so, what do their totems look like? Yes! This was one of the surprise announcements (the other being Zandalari Paladins) at BlizzCon when they discussed these two particular Allied Races. As for their totems, Wowhead has a full page on them, but they’re pretty much “totems x anchors” — and I think they nail the Kul Tiran aesthetic. Look, Gorak Tul is a cool bad guy and there’s definitely a lot more I want to know about him, but he is the Garrosh to Bwonsamdi’s Sylvanas. The latter group are clever. They’re cunning. They plan ahead and they know how to talk to enemy and ally alike. Gorak Tul has nothing on Bwonsamdi in that regard. Also, how could you ever beat Bwonsamdi’s voice acting? I’ve been grinding the game of life for 29 years now. Not once have I seen the secret to happiness drop. Any tips? I don’t know the degree to which you meant this as a “serious” question, but I will say this — if you’re really finding yourself never happy, go talk to someone. I don’t just mean you, either, SPencer — anyone reading this. Not being happy can be helped — I wouldn’t say “fixed,” because it’s an ongoing thing — by medication. It can be further helped by talking to someone regularly. The latter will hit your wallet harder than the former, but both are worthwhile investments. If you’ve legit never talked to your doctor about this sort of thing, it will make a difference. I realize it can sometimes seem like happiness is just… never going to be a thing you feel, but it is. The first few steps are daunting, but taking them isn’t nearly as bad as you think they’d be. There are a lot of resources out there to help improve your happiness. The key is utilizing them, sticking with them, and realizing your happiness can exist and it is worth finding. QftQ: Which faction leader do you think should be the next raid boss and why are we beating him/her up? …Can we please kill Malfurion? Please? All right, barring NOOOOOO-y McHushyface, I think Gallywix certainly deserves to get punched in the face… but I don’t actually think he’d become a raid boss. He’s too weasily. I think it’s more likely that we face someone like Nathanos. At this point, I really don’t know where his story is going to go, but if it ends up being the “he dies sticking with Sylvanas to the bitter end,” it would be interesting if we had to fight him as players. Especially Horde-side, he’s been with us throughout pretty much everything this expansion. He’s still an Edgelord Sass Machine, but I think he’s also gained some appreciation for the Horde as well. Maybe beating the snot out of him (but not killing him) is what it takes for him to turn on Sylvanas. Maybe he Nazgrims out of the game. Regardless, I wouldn’t be surprised if he became a raid boss eventually — I just hope they tell his story right in that case. Is it better to SoloQ or TeamQ? How much better do you need to be as a team to overcome any team-penalty? I prefer at least partially team queuing, if nothing other than it makes coordinating easier. Occasionally — and I think more so at higher SRs — you can get PUGs to hop in voice chat, but the quality of that can be… shotty. Knowing the people you’re with, having an understanding of how you’ll communicate… it helps quite a bit. That said, solo queuing has the “benefit” of a bit of randomness. You may queue as a full team of 6, but that just means you’re more likely to come across another full team of 6. If they outplay you, you can’t really attribute it to “that one player who never listened.” I think team queuing just means being prepared to come against players/comps that simply out-perform you. Try your best, move on if you lose. I’ll take that over the frustration of random folks messing up a game for the entire team. How would you feel about a void-based melee class? Do you think there is room for one in the game right now? Or would it be too similar to DK/DH? I don’t think it would be too similar to DKs or DHs, since they use death and fel, respectively. But I also would rather Blizzard use whatever flavor they’re going to toss into a hypothetical Void-based melee class and apply it to Shadow Priests. The Void Elf team in Island Expeditions has a lot of cool abilities, almost none of which Shadow Priests have. Rework Shadow in a way that incorporates those rather than give them to a new class.